But the Lord said to Ananias, “Go! This man is my chosen instrumentto proclaim my name to the Gentiles and their kings and to the people of Israel. Narrator: After the Holy Spirit came down at Pentecost, Peter and the other apostles started to share the good news of Jesus all over Jerusalem, and thousands of people believed. It was an exciting time as the church grew! But just like Jesus was hated by many people, the disciples and new believers were also hated. They were attacked, and put in jail, and some of them were even killed. One of the men who was strong in his faith, and who preached to everyone in the name of Christ, was Stephen. He challenged the leaders in Jerusalem, calling them hypocrites and challenging them to believe in Jesus. The leaders and the people became so angry that they stoned Stephen to death. Angry Crowd of Men: (Shouting everything at once) How dare he say that to us! Let's kill him! Stone him to death! He gets what he deserves! How can he say that about God's people! Narrator: On the day of Stephen's death, a young man named Saul was there, and saw it all. As the leaders came to pick up stones, they put their coats at Saul's feet so he could watch over their belongings. As he watched the crowd, Saul wanted to be part of it. He wanted to help punish Christians for what they claimed about Jesus. Saul: Hear me, men of Jerusalem! You have silenced Stephen who proclaimed Jesus as the Righteous One, the Messiah. We have killed this man just as his leader Jesus was killed. You've done well here, but it's not enough. Angry Crowd of Men: Tell us Saul! Yes, Tell Us! What shall we do with all these Christians? Saul: (Angry crowd of Men mutter and cheer throughout the speech) There are thousands of people who speak in the name of this man, Jesus. Let's go from house to house, and when we find them, we'll throw them in prison. Angry Crowd of Men: Lead us, Saul! Yes, let's get all of them, and then this trouble will be over! They all need to be arrested! Let's get them! Narrator: But instead of stopping the spread of the good news, the gospel was being spread even further. Those who had been scattered preached the word wherever they went. Saul kept on threatening to kill the Lord's followers. He even went to the high priest and asked for letters to the Jewish leaders in Damascus. High Priest: Saul, you have led a great persecution against these followers of Jesus. Why are you going to Damascus? And why do you want these letters to the leaders there? Saul: There are many followers of Jesus in that city. The letters will give me your authority to arrest people. That way when I find men and women who follow this Jesus, I can bring them back to Jerusalem as prisoners. Narrator: The trip from Jerusalem to Damascus was 135 miles, which would take several days on horseback. The route took travelers across mountains and rivers, making it a long and exhausting journey. Servant 1: I'm so weary. We've been travelling for days. Servant 2: Sir, can we stop soon for food, and to water the mules? The packs they're carrying are very heavy, and to be honest, we're all tired too. Saul: We aren't far now from Damascus. Come, let's continue. We'll be there soon. (Suddenly) Argggh! What is this? Such a strong bright light! Where is it coming from? Jesus: Saul! Saul! Why are you so cruel to me? Saul: Who are you, Lord? Jesus: I am Jesus. I am the one you are so cruel to. Now get up and go into the city, where you will be told what to do. Servant 1: My lord Saul, are you all right? Servant 2: We heard a voice, but we couldn't understand what it was saying. Servant 1: There was no one there! What happened? 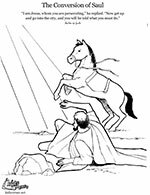 Saul: There was a great light from heaven, and … Please, please help me up! Oh, no, I can't see anything! I'm blind! Narrator: They then led him by the hand to Damascus, and for three days he was blind and did not eat or drink. Narrator: A follower of Jesus named Ananias lived in Damascus, and the Lord spoke to him in a vision. Jesus: Get up and go to the house of Judas on Straight Street. When you get there, you will find a man named Saul from the city of Tarsus. Saul is praying, and he has seen a vision. He saw a man named Ananias coming to him and putting his hands on him, so that he could see again. Ananias: Lord, a lot of people have told me about the terrible things this man has done to your followers in Jerusalem. Now the chief priests have given him the power to come here and arrest anyone who worships in your name. Jesus: Go! I have chosen him to tell foreigners, kings, and the people of Israel about me. I will show him how much he must suffer for worshiping in my name. Narrator: Ananias left and went into the house where Saul was staying, and Ananias placed his hands on him. Ananias: Saul, the Lord Jesus has sent me. He is the same one who appeared to you along the road. He wants you to be able to see and to be filled with the Holy Spirit. Saul: I can see! I can see! Thank you, Ananias – and thanks be to God! Ananias, I want to be baptized – please, come with me! Narrator: Because of his encounter with Jesus, Saul became a follower of the Messiah. Amazingly, God changed this persecutor into the greatest missionary in history. Saul is better known as the Apostle Paul, who was responsible for spreading the gospel throughout the Roman Empire, and even to the great city of Rome! If you would like to read more about the work and travels of Paul, the great missionary, check out the New Testament book of Acts.